This section provides reference information about the flow variables. Each of these variables is described in the sections that follow. A flow variable refers to a value within a context. The value of a flow variable can be either a primitive type (such as a string, boolean, or integer) or a reference to a specific object, such as an object instantiated by Edge during request/response processing. Whether a flow variable refers to a primitive type or an object depends on the context—the time at which you refer to it. The context for a flow variable is the flow segment in which an API proxy processes a request/response. For example, in any segment of the response flow context, the response flow variable refers to the response object. In most cases, you can think of flow variables as referencing an object. To refer to properties of that object, you use dot notation. For example, to access the content property of response, use response.content. 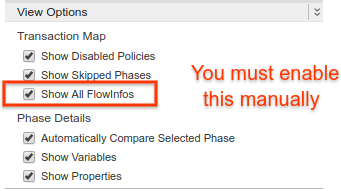 For information on using flow variables, see Flow variables overview. Not all flow variables are accessible from all policies or tools (such as the Trace tool). For example, in the request PreFlow, you won't be able to access the response. Most properties are read only. Where some are read/write, they might be read only, too, depending on where in the flow you access them. Some policies define policy-specific flow variables. For example, the ResponseCache policy defines a responsecache variable. For more information, see the policies reference. Do not rely on undocumented variables in your API proxies and apps. For example, do not rely on the values in the undocumented X-Apigee. * headers in your API proxies as these headers are not intended for customer use and can be removed or changed by Apigee at any time. The Trace tool lets you see the values of flow variables as you step through the API proxy flow. The AssignMessage policy lets you modify the variables in your API proxy flow. A helper variable that provides information about execution time of the policy. For more information on working with API proxies, see Understanding APIs and API proxies. A container for the application.basepath property. The application or system that sent a request to the Edge router. The HTTP port associated with the originating client request to the ProxyEndpoint. The time, expressed in string form, at which the proxy finished receiving the request from the originating client at the ProxyEndpoint. For example: Wed, 21 Aug 2013 19:16:47 UTC. This time value is the string representation of the corresponding 32-bit timestamp quantity. For example, 'Wed, 21 Aug 2013 19:16:47 UTC' corresponds to the timestamp value of 1377112607413. The timestamp value specifying when the proxy finished receiving the request from the originating client at the ProxyEndpoint. This value is a 64-bit (long) integer containing the number of milliseconds elapsed since midnight, on January 1, 1970 UTC. The timestamp value specifying when the proxy began receiving the request from the originating client at the ProxyEndpoint. This value is a 64-bit (long) integer containing the number of milliseconds elapsed since midnight, on January 1, 1970 UTC. The time, expressed in string form, at which the proxy finished sending the response from the ProxyEndpoint to the client. For example: "Wed, 21 Aug 2013 19:16:47 UTC". This value is a string representation of the corresponding 32-bit client.sent.end.timestamp. For example, "Wed, 21 Aug 2013 19:16:47 UTC" corresponds to the timestamp value of 1377112607413. This property is only available in the ProxyEndpoint response's PostClientFlow. In all other flows, the value of this property is the empty string. For information about accessing this property, see MessageLogging policy. client.sent.end.timestamp Long Read only The timestamp value specifying when the ProxyEndpoint finished returning the response to the originating client app. This value is a 64-bit (long) integer containing the number of milliseconds elapsed since midnight, on January 1, 1970 UTC. This property is only available in the ProxyEndpoint response's PostClientFlow. In all other flows, the value of this property is -1.
client.sent.start.time String Read only The time, expressed in string form, when the ProxyEndpoint started returning the response to the originating client app. For example, "Wed, 21 Aug 2013 19:16:47 UTC". This value is a string representation of the corresponding 32-bit client.sent.start.timestamp. For example, "Wed, 21 Aug 2013 19:16:47 UTC" corresponds to the timestamp value of 1377112607413.
client.sent.start.timestamp Long Read only When the proxy began sending the response to the client from the ProxyEndpoint. This value is expressed as a 64-bit (long) integer containing the number of milliseconds elapsed since midnight, on January 1, 1970 UTC. "true" if the ProxyEndpoint is configured for TLS/SSL; otherwise "false". Contains information about the current API proxy flow. You can view these properties in the Edge UI's Trace view. However, these properties are not visible by default in the Classic UI's Trace view. Log in to the Edge Management UI. Select APIs > API Proxies. The API Proxies list view is displayed. Select your API Proxy to see the proxy's summary view. If you don't see your proxy in the list, be sure that you selected the right organization, as described in A word about organizations. Click the Trace tab. The Trace view is displayed. A container for the environment.name property. A contextual object that represents an error message in the error flow. Error variables are only available in the error flow. Message associated with an error, whose value is available only before the error Flow is executed. The HTTP status code associated with the error. For example, "400". The reason phrase associated with the error. For example: "Bad Request". Any error of type TransportMessage. State in the Flow where an error occurred. A container for the is.error property. Provides information about the TargetEndpoint's load balancing status. List of failed TargetServers during load balancing at TargetEndpoint. "true" if fallback is enabled for the TargetServer invoked during load balancing at TargetEndpoint. A contextual object, with the same value as request in the request flow or as response in the response flow or as error in the error flow. Content of the request, response, or error message. Value of the specified form parameter. All values of the specified form parameter in the message. Count of all form parameters in the message. Value of all form parameters in the message. Value of form string in the message. Gets or sets the value of the specified HTTP header in the message. If the header contains a comma, upon read you will receive only the segment of the text up to the first comma. If you want the entire header, use the form request.header.header_name. The value of the Nth particular header value in the message, either request or response, depending on the state of the flow. Apigee Edge splits header text values by commas. Note that the index whose value is used for N is 1-based, not 0-based. For example: if the Cache-control header is "public,maxage=16544", then the return value of message.header.cache-control.1 is "maxage=16544". All values of the specified HTTP header name in the message. Count of the values of the specified HTTP header name in the message. Count of all HTTP headers in the message. The complete request message path in URL excluding any query parameters. The value of the Nth query parameter in the message. For example, if the request.querystring is "a=hello&a=world", then the return value of message.queryparam.a.1 is "hello". All the values of a particular query parameter in the message, formatted as a comma-separated list. For example, if the query string is a=hello&a=world, then the value of message.queryparam.a.values is "['hello', 'world']". The total count of a specified query parameter associated with the request sent to the ProxyEndpoint from the client app. For example, for the request "http://api.apifactory.com/inventors?name=nick&surname=danger", the value of message.querystring is "name=nick&surname=danger". ReasonPhrase of the response message from target. HTTP status code of the response message from target. Message of type TransportMessage which is a contextual object. For example, for the request "http://api.apifactory.com/inventors?name=nikola&surname=tesla", this variable returns "inventors?name=nikola&surname=tesla". The HTTP verb (GET, PUT, POST, DELETE, etc.) associated with the request. The HTTP version associated with the request sent to the ProxyEndpoint from the client application. For more information on messages, see Message template function reference. A container for the globally unique ID for the request. This ID is logged in Edge error logs to correlate the messageid with the errors. A container for the organization.name property. For more information on organizations, see Understanding organizations. The only way you'd know this is by looking at the API proxy definition or checking the value of the proxy.basepath variable. The proxy path suffix follows the base path ("/forecastrss"), along with any query parameters. If you define a dynamic Base Path in your API proxy configuration, such as "/v2/*/weatherapi", then this variable is set to the dynamic path ("/v2/*/weatherapi"), even though the base path resolves to a static value, such as "/v2/foo/weatherapi". The X-Forwarded-For address of the inbound call, which is the IP address Edge received from the last external TCP handshake. This could be the calling client or a load balancer. The name attribute configured for the ProxyEndpoint. The value of API proxy basepath suffix that is sent from the client and received at the ProxyEndpoint. The basepath is defined as the path component that uniquely identifies the API proxy. The public-facing URL of an API proxy is comprised of your organization name, the environment where the proxy is deployed, the basepath, the basepath suffix, and any query parameters. For example, in a request to http://myorg-test.apigee.net/v2/weatherapi/forecastrss?w=12797282, the basepath suffix is "/forecastrss". For an example that constructs a request URL using the original host, see Access request messages. For more information about request data, see How is request data passed to the backend server? Gets or sets the value of the specified form parameter in the request sent from the client application. All the values of a particular form parameter in the request, formatted as a comma-separated list. For example, if the payload is "a=hello&x=greeting&a=world", then the value of request.formparam.a.values is "['hello', 'world']". The value of the Nth particular form parameter in the message. For example, if the form string is "a=hello&a=world", then the return value of request.formparam.a.1 is "hello". Count of all form parameters associated with the request sent from the client application. The complete formparam in the request sent from the client app. Gets or sets the value of a particular header found in the request. If the header contains a comma, upon read you will receive only the segment of the text up to the first comma. If you want the entire header, use the form request.header.header_name.values. The value of the Nth particular header value in the request. Apigee Edge splits header text values by commas. Note that the index whose value is used for N is 1-based, not 0-based. For example, if the Cache-control header is "public, maxage=16544", then the return value of request.header.cache-control.1 is "maxage=16544". All the values of a particular header in the request. Names of all the headers in the request. For example, of the URI to the backend service is "https://example.com/rest/api/latest", then the value of request.path is "/rest/api/latest". The value of the Nth query parameter in the request. For example, if the request.querystring is "a=hello&a=world", then the return value of is request.queryparam.a.1 is "hello". All the values of a particular query parameter in the request, formatted as a comma-separated list. For example, if request.querystring is "a=hello&b=lovely&a=world", then the value of request.queryparam.a.values is "['hello', 'world']". For example, if the request is "http://host.com/123?name=first&surname=second&place=address", then this variable returns "name=first&surname=second&place=address". ID of the request as type TransportMessage which is a contextual object. Request of type TransportMessage which is a contexual object. In the request, request.uri is the proxy base path + the remainder of the address, including query parameters. In the response, request.uri is the remainder of the address, including query parameters, after the HTTPTargetConnection. Which appends "/user?user=Dude" to that URL. The complete URL of the request made to the target endpoint, including the query string parameters, but not including the port number (if specified). The HTTP verb used for the request. For example, "GET", "PUT", and "DELETE". The HTTP version of the request. For example, "1.1". The complete response, including any payload present. Complete response message returned by target. Payload content of the response message returned by the target. The value of a form parameter in the response. Count of all the values of the specified form parameter in response. Count of all form prameters in the response. The names of all the form parameters in the response. Gets or sets the value of a specified HTTP header in the response. If the header text includes a comma, Apigee Edge infers multiple values. In this case, response.header.header_name returns the first value only. To read the entire header, use the form response.header.header_name.values. All the values of a specified HTTP header in response. Count of all the values of the specified HTTP header in response. The value of the Nth particular header value in the response. Apigee Edge splits header text values by commas. Note that the index whose value is used for N is 1-based, not 0-based. For example, if the Cache-control header is "public, maxage=16544", then response.header.cache-control.1 returns "maxage=16544". Count of all the headers in the response. The names of all the headers in the response. The response reason phrase for a particular request. The response code returned for a request. You can use this variable to override the response status code, which is stored in message.status.code. For more, see message. Response of type TransportMessage which is a contexual object. Specifies the names of the <RouteRule> and TargetEndpoint. The name of the <RouteRule> that was executed in the ProxyEndpoint. For example, "default". A RouteRule references an API proxy TargetEndpoint to execute. The name of the TargetEndpoint that was executed. For example, "default". A container for the router.uuid property, which is deprecated. Describes the TargetEndpoint for a ServiceCallout policy. The expected Common Name of the TargetEndpoint as referred to in a ServiceCallout policy policy. This is meaningful only when the TargetEndpoint refers to an TLS/SSL endpoint. The TargetEndpoint URI for a ServiceCallout policy policy. The URI is the TargetEndpoint URL without the protocol and domain specification. Specifies the IP address of the system, as well as details about the proxy. The time when this variable was read. For example, "Wed, 21 Aug 2013 19:16:47 UTC". This value is the string representation of the corresponding value of system.timestamp. For example, "Wed, 21 Aug 2013 19:16:47 UTC" corresponds to the timestamp value of "1377112607413". The year portion of system.time. The month portion of system.time. The day of month portion of system.time. The day of the week portion of system.time. The hour portion of system.time. The minute portion of system.time. The second portion of system.time. The millisecond portion of system.time. The 64-bit (long) integer representing the time that this variable was read. The value is the number of milliseconds elapsed since midnight, on January 1, 1970 UTC. For example, "1534783015000". Describes the target of the request. The resource path (not including the domain) to the target service, excluding query parameters, that is defined in the proxy's TargetEndpoint. In this example, the target.basepath is "/user". The target.basepath would be null. When "true", request forwarded from ProxyEndpoint to TargetEndpoint retains query parameters. Target to which message is reaching from targetendpoint. Organization of the TLS/SSL certificate presented by the target server. Organization unit of the TLS/SSL certificate presented by the target server. The time, expressed in string form, at which the TargetEndpoint finished receiving the response from the target. For example, "Wed, 21 Aug 2013 19:16:47 UTC". This time value is the string representation of the corresponding 32-bit timestamp quantity. For example, "Wed, 21 Aug 2013 19:16:47 UTC" corresponds to the timestamp value of "1377112607413".. The timestamp value specifying when the TargetEndpoint finished receiving the response from the target. For example, "1534783015000". This value is a 64-bit (long) integer specifying the number of milliseconds elapsed since midnight, on January 1, 1970 UTC. The time, expressed in string form, at which the TargetEndpoint started receiving the response from the target. For example, "Wed, 21 Aug 2013 19:16:47 UTC". This time value is the string representation of the corresponding 32-bit timestamp quantity. For example, "Wed, 21 Aug 2013 19:16:47 UTC" corresponds to the timestamp value of "1377112607413". The timestamp value specifying when the TargetEndpoint started receiving the response from the target. For example, "1534783015000". This value is a 64-bit (long) integer specifying the number of milliseconds elapsed since midnight, on January 1, 1970 UTC. Returns http or https depending on the request message. The time, expressed in string form, at which the proxy stopped sending the request to the URL specified in the TargetEndpoint. For example, "Wed, 21 Aug 2013 19:16:47 UTC". The timestamp value specifying when the proxy finished sending the request to the URL specified in the TargetEndpoint. For example, "1377112607413". This value is a 64-bit (long) integer containing the number of milliseconds elapsed since midnight, on January 1, 1970 UTC. The time, expressed in string form, at which the proxy began sending the request to the URL specified in the TargetEndpoint. For example, "Wed, 21 Aug 2013 19:16:47 UTC". The timestamp value specifying when the proxy started sending the request to the URL specified in the TargetEndpoint. For example, "1534783015000". This value is a 64-bit (long) integer specifying the number of milliseconds elapsed since midnight, on January 1, 1970 UTC. Whether TargetEndpoint is running on TLS/SSL. State of the TLS/SSL certificate presented by the target server. A container for the variable.expectedcn property. Variable exposed for the common name if it's running on TLS/SSL. For more information on working with TLS, see the TLS/SSL introduction. Specifies details about the virtual host. Host aliases of the virtual host that is hit during a particular request. Name of the virtual host that serves the originating client request. Returns "true" if TLS/SSL is enabled in the virtual host configuration. For more information on working with virtual hosts, see Configuring virtual hosts.